Dr. Hong studied in Taiwan and Australia before moving to the United States. She is a specialist in genetic research and worked as a research associate for Mississippi State University and Ohio State University before coming to Sterling. Her teaching strategy is to instruct in a way that enables students to understand the concepts thoroughly, analyze the issues critically and apply knowledge in practical ways. She also places significance on student learning through experience, by a series of practical experiments and tasks. Working with students is very rewarding for Dr. Hong, and she hopes to promote their growth both professionally and personally. She believes that, in the role of a professor, bringing out the best from the students is a way to love God and one’s neighbors. She also thinks that it is essential to ensure the students feel encouraged and cared for during their learning process. Dr. Hong’s professional research interests include plant molecular biology and microbiology. Recent research projects she has conducted at Sterling College are related to the impact of changing local weather patterns on different wheat varieties. This genetic study is enabling a better choice of wheat varieties for the local farmers. Kakani, A., Chitteti, B., Hong, W. F. and Peng, Z. P. 2007 Developing a method for quantitative comparison of molecular reporters among individual cells and determining the auxin level required for cell dedifferentiation in Arabidopsis. Botany and Plant biology Joint congress July 7-11, conference abstract. Kakani, A., Hong, W. F., and Peng Z. P. 2006. Role of Auxin in Cell Dedifferentiation. The Annual meeting of The American Society of Plant Biologists. Boston, August 5-9, Conference abstract. Oberhofer, A., Hong, W. F., and Peng, Z. P. 2006. Characterization of a cell dedifferentiation mutant in Arabidopsis. ASBMB Annual Meeting and Centennial Celebration. San Francisco, April 1-5, Conference Abstract. Hong, W. F., and Krishnapillai, V. 1999 Genome organization of Ralstonia (Pseudomonas)solanacearum. Pseudomonas 99: Biotechnology and Pathogenesis Conference. Maui, Hawaii, 1-5 Sept, - Conference Abstract. 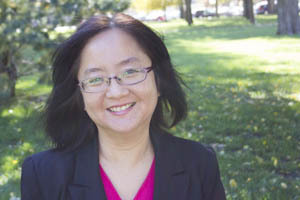 Opina, N., Tavner, F., Hollway, G., Wang, J-F., Li, T-H., Maghirang, R., Fegan, M., Hayward, A. C., Krishnapillai, V., Hong, W.F., Holloway, B. W. and Timmis, J. N. 1997. A novel method for development of species and strain-specific DNA probes and PCR primers for identifying Burkholderia solanacearum (Formerly Pseudomonas solanacearum). Asia Pacific Journal of Molecular Biology and Biotechnology 5(1):19-30. Hartman, G. L., Hong, W. F., Hanudin, and Hayward, A. C. 1992. Potential of biological and chemical control of bacterial wilt. In: International Bacterial Wilt Symposium. Kaohsiung, Taiwan. Bacterial Wilt. ACIAR Proceedings No. 45, 322-326. Hartman, G. L., Huang, Y. H. and Hong, W. F. 1992. Interaction of Pseudomonas solanacearum and Phytophthora capsici on peppers. In: International Bacterial Wilt Symposium. Kaohsiung, Taiwan. Bacterial Wilt. ACIAR Proceedings No. 45, 348-351. Hong, W. F., Hsu, S. T. and Tzeng, K. C. 1992. Bacterial wilt of Perilla crispa : A new host and new transmission method. In: International Bacterial Wilt Symposium. Kaohsiung, Taiwan. Bacterial Wilt. ACIAR Proceedings No. 45, 373-376. Hartman, G. L., Hong, W. F. and Wang, T. C. 1991. Survey of bacterial wilt on fresh market hybrid tomatoes in Taiwan. Plant Protection Bulletin 33:197-203. Hong, W. F. 1990. Studies on bacterial wilt of Perilla caused by Pseudomonas solanacearum. Master Thesis. Research Institute of Plant Pathology in National Chung-Hsing University.